Does your head ever spin from all the suggestions you get about how to manage your young child’s temper tantrums or out-of-control behavior? Your in-laws tell you you’re spoiling your child, your best friend thinks you’re being too strict, and the other parents you know all seem to follow a different playbook. Related: How to take charge as a parent and get control back. Knowing how to effectively handle your young child or toddler can feel overwhelming at times.There’s so much advice about what we should do that it’s easy to start feeling confused and unsure of your own parenting skills. Too often parents work under the faulty assumption that if they can simply explain things to a tantruming child, the child will fall in line and stop misbehaving. The truth is, there is no “magic,” one-size-fits-all way to parent your toddler. The true expert of your child is you. Believe me, I understand that it can be hard to trust your parenting gut when your toddler is having a tantrum in the middle of the grocery store! But part of becoming the most effective parent you can is to begin to develop parenting skills that combine your intuition, your strengths, and the values most important to you. What I tell all parents of young kids is the following: As you navigate through your parenting years, you’ll try some methods that will work and you’ll put them in your toolbox. You’ll quickly discard the methods that don’t work. And along the way, you’ll figure out what works best for your family. Part of finding your way is learning what not to do when parenting your tantruming child. This can be confusing, since so much parenting advice is based on what you should be doing—but the truth is, figuring out what pitfalls to avoid is just as important. Giving your child a sense of control on issues that are not that important in the long run allows your child a sense of autonomy in a world that is very structured and rule-oriented. Simple choices on a daily basis make it less likely that your child will want to fight you on the big stuff. Related: Doing too much for your kids? How to teach them to be more responsible for themselves. Carly was 3 1/2 years old and had always been a great sleeper as a baby. Her parents would rock her and lay her in her crib, and she would sleep through the night. Since getting her big girl bed, Carly began to fight her bedtime, get up in the middle of the night, and wake her parents. At a loss for how to get Carly to sleep, her parents gave her too many choices. If Carly wanted to read a book at 3:00 a.m. they read with her. If she wanted some juice, they’d bring it to her. If she wanted to sleep with them, but then change her mind 20 minutes later, they’d walk her back to her room. They allowed her to dictate the terms of her bedtime and sleep schedule instead of getting control of the situation. A better option would be to set the guidelines for Carly before bedtime, saying something like, “Tonight we’ll read two stories, have one song, then it’s time for bed. If you wake up in the middle of the night, I will walk you back to bed and you will stay there”. After Carly’s parents enlist her help in making her room as comfortable and cozy as possible, she will know what is expected of her for future bedtimes. Toddlers need someone to be in charge, and that’s you. While you can benefit from giving your child choices, you will also benefit from setting loving boundaries so your child can feel safe and satisfied in the choices she has made. 3. Don’t reason with a defiant toddler. Toddlers are irrational by nature, and as a parent it’s important to simply accept this fact. Too often parents work under the faulty assumption that if they can simply explain things to a tantruming child, the child will fall in line and stop misbehaving. As a result, many parents talk over the developmental level of their toddler. 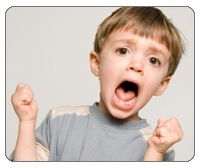 The outcome is simply more screaming and misbehaving by the child—and more frustration on the part of the parent! A rule of thumb is to try using approximately as many words as the age of your child. For example, if your two-year-old bites, you say, “No biting” and remove her from the situation. If your 5-year-old starts having a tantrum in the middle of the store, you say, “We don’t cry over toys,” and you leave. The point is, a long, drawn-out speech by you solves nothing—and your young child or toddler will just tune out. The best way to deal with a defiant toddler is to take swift, immediate action that involves the smallest number of words possible. Since we as adults communicate (hopefully) in rational, mature ways with other adults, we assume that we can do the same with our toddlers. Bear in mind, though, that your toddler lacks the maturity at this stage in their development to be reasonable most of the time. Brevity and calmness are a parent’s best friend at this stage. Related: How to give your child consequences that will really work. Sam, a funny, strong-willed 5-year-old became frustrated while trying to put together his new Lego set. No matter how much he tried, he couldn’t understand the instructions, which were a bit over his head. Not knowing how to proceed, he did the first thing that came to his mind: he picked up his Lego set and threw it at his 3-year-old sister’s head, screaming at his mother all the while. His mother, while horrified and angry in the moment, stayed calm. She took him by the arm and told him “We don’t scream or throw toys,” and led him to his room for a cooling-off period. Besides handling the situation calmly and effectively, Sam’s mom modeled for him how he can react in the future when he becomes frustrated and angry. Toddlers don’t know what to do when faced with a rush of emotion, so they do what comes naturally: they have a fit! This type of behavior is perfectly normal for all toddlers, but it is imperative that they learn early that while it’s normal, it won’t be tolerated in your house. Your job is to show your child the right way to react; staying calm and consistent is the best way to teach them. By the way, if you find that you are having a hard time controlling your own temper, seek out support in the form of friends, other parents with same-age children, or by taking a parenting class at your local rec center or church. Having a support system during these difficult years of child-rearing can be a life saver. Related: Stay calm with your child--even when he's pushing your buttons. Toddlers are interesting little beings, filled with passion, humor, curiosity, and willfulness. They are just beginning to understand the bigger world around them, to navigate the daily routines of their home and school life, and to test boundaries to see what the outcome may be. As your child leaves babyhood and enters the independent stage of their development, it’s important for you too to grow as a parent and to recognize that your parenting style needs to change along with your toddler. Parenting a baby, while difficult at the time, may seem downright easy when faced with a screaming three-year-old. It’s really important at this age for you to take an inventory of what works and what isn’t working when dealing your young child or toddler. By trusting your instincts and implementing rules that you are comfortable with, you will be doing all the right things to help not just your child, but your entire family.